I’m guessing that some of you are super familiar with Advent, while others of you are like, “Wha…?” Advent, which simply means “arrival” is celebrated by Christians for the four weeks leading up to Christmas, Jesus’ arrival. (Yeah, we all know that He wasn’t actually born on December 25, but that’s when we celebrate His birth anyway. Can we please avoid arguments about that? Thanks.) Anyway, each of the four weeks has a theme. Week 1 is hope, week 2 is peace, week 3 is joy, week 4 is love. Lots of churches, including ours will light one candle the first week, 2 candles the second week, etc., and read scripture and/or sing songs that revolve around the week’s theme. The gold is Wet n Wild Fergie – Gold Album. I topped it with a multicolored glitter polish. The purple on my middle finger is Gap – Pop Star. I’m pretty sure this polish is more than a decade old. The background color for the candles is Wet n Wild – Echo Dark that I used most recently for a matte jelly sandwich in this post. Everything on this nail, besides Echo Dark is craft paint. I’m really happy with how these turned out! They are so festive, but are a nice change of pace from snowmen, reindeer, and Santa. 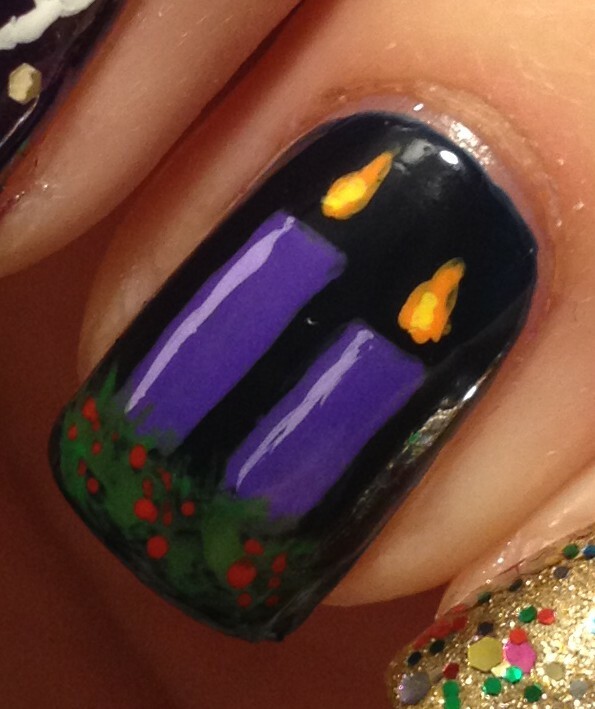 This entry was posted in Christmas Nails and tagged advent, advent candles, advent nails, christmas, holiday, nail art, wet n wild. Bookmark the permalink. Is the vertical line on the candles something you added with acrylic paint or is it just an “appearance” in the photo? It looks very nice. Also, thanks for explaining how Advent “works.” I never knew before and it is interesting. 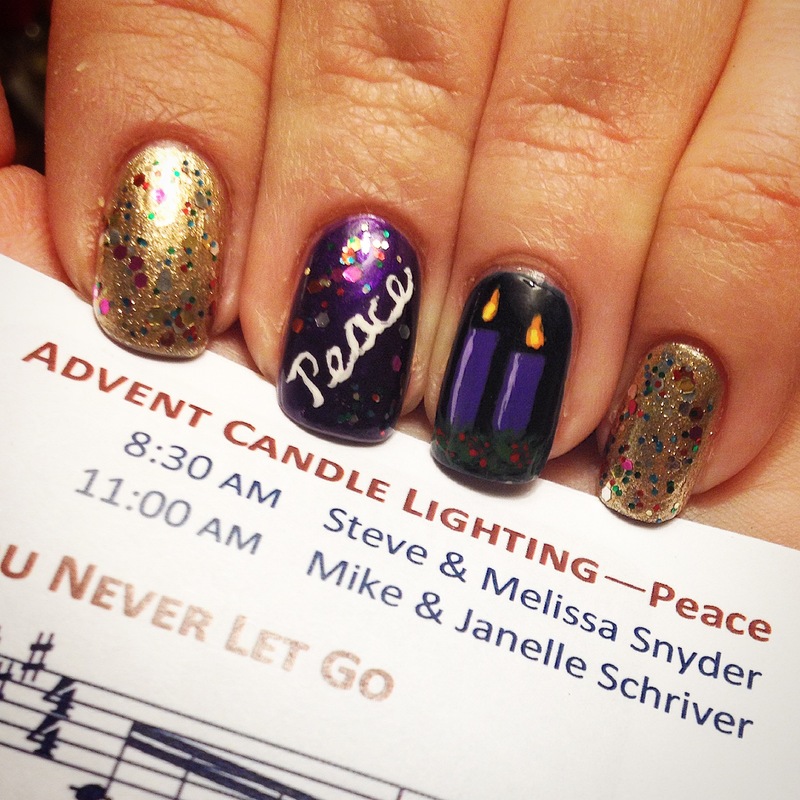 For the “highlight” on the candle, I just mixed a little white in to the same purple that I used for the candles and painted in the thin stripe. I’m working to get better with details like that! I love checking out Jaunty Juli’s youtube videos. She’s an expert at shading/highlighting in her nail art!